Edison Studios was an American film production organization, owned by companies controlled by inventor and entrepreneur, Thomas Edison. 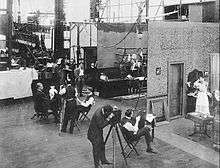 The studio made close to 1,200 films, as part of the Edison Manufacturing Company (1894–1911) and then the Thomas A. Edison, Inc. (1911–1918), until the studio's closing in 1918. Of that number, 54 were feature length, and the remainder were shorts. The first production facility was Edison's Black Maria studios, in West Orange, New Jersey, built in the winter of 1892–93. The second facility, a glass-enclosed rooftop studio built at 41 East 21st Street in Manhattan's entertainment district, opened in 1901. In 1907, Edison had new facilities built, on Decatur Avenue and Oliver Place, in the Bronx. Thomas Edison himself played no direct part in the making of his studios' films, beyond being the owner and appointing William Gilmore as vice-president and general manager. Edison's assistant William Kennedy Dickson, who supervised the development of Edison's motion picture system, produced the first Edison films intended for public exhibition, 1893–95. After Dickson's departure for the American Mutoscope and Biograph Company in 1895, he was replaced as director of production by cameraman William Heise, then from 1896-1903, by James H. White. When White left to supervise Edison's European interests in 1903, he was replaced by William Markgraf (1903–1904), then Alex T. Moore (1904–1909), and Horace G. Plimpton (1909–1915). 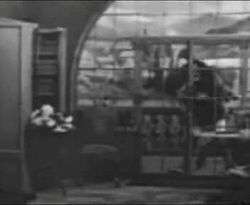 The first commercially exhibited motion pictures in the United States were from Edison, and premiered at a Kinetoscope parlor in New York City on April 14, 1894. The program consisted of ten short films, each less than a minute long, of athletes, dancers, and other performers. 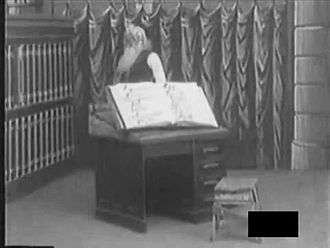 After competitors began exhibiting films on screens, Edison introduced its own, Projecting Kinetoscope, in late 1896. The earliest productions were brief "actualities", showing everything, from acrobats, to parades, to fire calls. But, competition from French and British story films, in the early 1900s, rapidly changed the market. By 1904, 85% of Edison's sales were from story films. In December 1908, Edison led the formation of the Motion Picture Patents Company in an attempt to control the industry and shut out smaller producers. The "Edison Trust," as it was nicknamed, was made up of Edison, Biograph, Essanay Studios, Kalem Company, George Kleine Productions, Lubin Studios, Georges Méliès, Pathé, Selig Studios, and Vitagraph Studios, and dominated distribution through the General Film Company. The Motion Picture Patents Co. and the General Film Co. were found guilty of antitrust violation in October 1915, and were dissolved. The breakup of the Trust by federal courts, under monopoly laws, and the loss of European markets during World War I, hurt Edison financially. 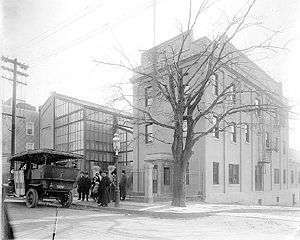 Edison sold its film business, including the Bronx studio, on 30 March 1918, to the Lincoln & Parker Film Company, of Massachusetts. In December 2013, a new trademark was approved, by the US Patent and Trademark office, for Edison Studios LLC, based in Santa Monica, California. Edison Studios LLC's new partners were Carl Colpaert and Shervin Pishevar. 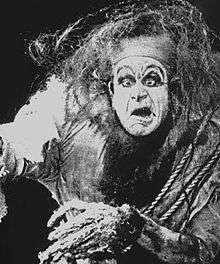 In 1910, Edison Studios produced the first motion picture adaptation, of Mary Shelley's Frankenstein. Some of the studio's notable productions include The Kiss (1896), The Great Train Robbery (1903), Alice's Adventures in Wonderland (1910), the first Frankenstein film in 1910, the first ever serial made in 1912 titled What Happened to Mary, and The Land Beyond the Sunset (1912), which film historian William K. Everson considered "the screen's first genuinely lyrical film". 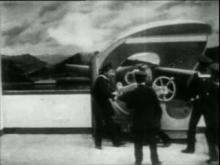 The company also produced a number of short "Kinetophone" sound films in 1913–1914 using a sophisticated acoustical recording system capable of picking up sound from 30 feet away. The studio also released a number of Raoul Barré cartoon films in 1915. Several films, in production, circa 1914-1915, at Edison's Bronx studio. Seated, in the foreground, with his legs crossed is Charles Brabin and seated to the rear, with the card reading "26", under his arm, is Harold M. Shaw. [T]he Edison studios never turned out a notable director, or even one above average. Nor did the Edison films show the sense of dynamic progress, that one gets, from studying the Biograph films, on a year-by-year basis. On the contrary, there is a sense of stagnation. However, new restorations and screenings of Edison films in recent years contradict Everson's statement; indeed, Everson citing The Land Beyond the Sunset points out creativity at Edison beyond Porter and Collins, as it was directed by Harold M. Shaw (1877–1926), who later went on to a successful career directing in England, South Africa, and Lithuania before returning to the US in 1922. Other important directors who started at Edison included Oscar Apfel, Charles Brabin, Alan Crosland, J. Searle Dawley, and Edward H. Griffith. The climax of Frankenstein (1910). ↑ Conot, Robert (1979). Thomas A. Edison : a streak of luck. New York, N.Y.: Da Capo Press. ISBN 9780306802614. ↑ "Motion Picture Patents Company". Encyclopædia Britannica. Encyclopædia Britannica Online. Retrieved 2007-04-13. ↑ U.S. v. Motion Picture Patents Company., 225 F. 800 (E.D. Pa. Oct. 1, 1915). ↑ "Company Records Series — Motion Picture Patents Company". The Thomas A. Edison Papers. Retrieved 2007-04-13. ↑ Everson, William K. (1998). American Silent Film. New York: Da Capo Press. ISBN 0-306-80876-5. Wikimedia Commons has media related to Edison Studios films.